What do New Yorkers specifically need to have in mind when considering whether to get a dog? Often, people tell me they feel guilty getting a dog in New York City because people work so many hours and our space is smaller than in outside the city. But neither reason is something they should be overly concerned with. 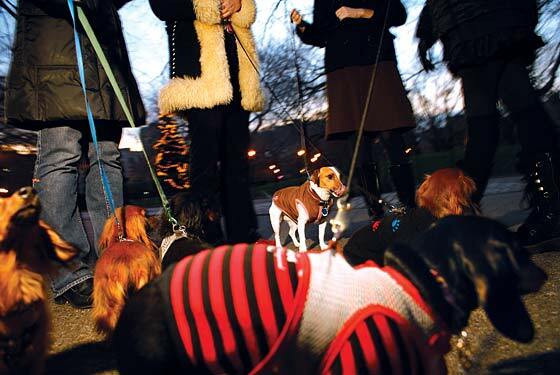 Most New Yorkers give their dogs a really, really good life. New York dogs need to be better behaved than suburban dogs because we’re living in such close quarters. Having a dog that barks excessively when someone walks by the apartment door is unacceptable. Is it true pet stores are fronts for puppy mills? Some stores will claim their puppies come from good breeders—but, logically speaking, wouldn’t a good breeder want to know what home their dog’s going to? In my mind, a puppy mill is a place where animals are bred for income, where the breeders aren’t doing as much as they can to raise the puppies properly. So yes, the majority of dogs in these pet stores are from puppy mills. And the reason the stores do well is the guilt factor. People think that by buying from a pet store, they’re saving that dog in the window. But by paying $3,000, you’re not rescuing that dog; all you’re doing is condemning that dog’s parents to being bred that many more times while living in a tiny little cage in South Dakota or Missouri. What’s the first thing you should do when you bring home a puppy? Put the puppy in its pen or its crate and give it something to play with. You’ve set a precedent for the behavior you like: behaving quietly and playing with toys. Confine the puppy safely for potty training with a crate for short-term periods—about three feet by two and a half to three feet—and then use a baby gate or exercise pen to create a long-term confinement area, about the size of a small bathroom. The puppy will mostly sleep, but don’t leave her alone with toys that are boring or easily destructible, like a stuffed animal. I love Busy Buddy toys because treats can be stuffed inside. Turn your dog into a chew-toy-aholic. The more time spent on toys, the less time she’s barking. What about the urban wisdom that puppies shouldn’t be let out of the house for several months for fear of catching germs? If your vet’s allowing you to bring your puppy into a waiting room—which would be one of the most dangerous places—then there’s no reason to be hysterical about exposing your dog outside. Wait a month. A name should mean “look at me,” but when you’re cooing it over and over, the puppy will learn to ignore you. Also, waiting allows you to choose a name that’s well suited. Author and trainer Andrea Arden is the head of Andrea Arden Dog Training (212-414-9597).